Hello! How are you?! Excellent, glad to hear it. Well here at 7 Reasons, we’re uncommonly excited because yesterday, @davidofyork tweeted a link to an obscure piece of punctuation called the interrobang, which has apparently been around since 1962. It’s used to convey excitement or disbelief in the form of a question. Here are seven reasons that it’s amazing. 1. It Looks Amazing! Look at it! Look at it! It’s up there! It’s a question! It’s an exclamation! It’s a quesclamation! It’s an exclamastion! It’s two different things fused together in a perfect visual synergy. You may never have seen an interrobang before but if you’ve ever seen a question mark and an exclamation mark a casual glance at it will instantly convey its meaning. It’s bloody perfect. 2. It’s Called An Interrobang! An interrobang! Have you ever heard a better portmanteau word? No, I thought not. It’s amazing. It takes the interro from interrogate and the bang from bang! There is surely only one better word in the world, and that word is hereisabowloftiramisuthesizeofscotlandhelpyourself which isn’t even a real word. Interrobang is real. Interrobang! 4. It’s Easy To Use! How do I use an interrobang?! Like that! Can I use it this way round as well!? Yes! It’s that simple. 5. It’s Fun To Use! I’ll let you into a secret. I bloody love writing. I find the act of forming thoughts into words and sentences then punctuating them and playing with them until they convey what I wanted to say in a pleasing way an absolute joy. But then I discovered the interrobang, and do you know what?! Writing became a hundred times more fun. Because now I get to write words and when the time comes to punctuate them I get to use the interrobang! And better than that, I am now able to use the word interrobang! A lot! Interrobang! It’s amazing! I’m literally bouncing around with excitement because of the interrobang! Every time I use an interrobang or use the word interrobang it’s a thrill, though I do promise never to drink this much coffee before writing a 7 Reasons post again. But only if I can say interrobang again. Interrobang! 6. It Makes You Cool! Some things are intrinsically cool. Knowing what an umlaut is, is cool. Steve McQueen in Bullitt, is cool. But now you’re cooler than that, because knowing what an umlaut is, is nowhere near as cool as knowing what an interrobang is, because the interrobang is just about the most awesome thing in the world! And it’s still quite obscure. And now, when you watch Bullitt, there’ll be a nagging thought in the back of your mind: Well, you’re pretty cool, Steve McQueen, but you don’t know what an interrobang is and I do! You’re now cooler than Steve McQueen because of the interrobang! 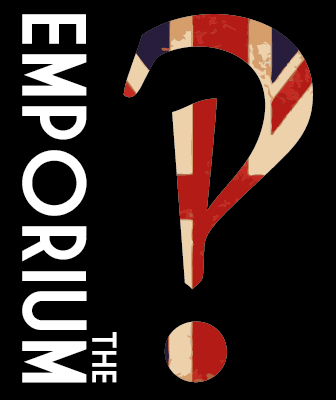 How cool is the interrobang?! 7. Interrobang?! Interrobang! Interrobang?! Interrobang! Look at the interrobang! Look at the word interrobang! It’s there at the start of this paragraph having a conversation with itself! It’s that awesome! It’s the interrobang! It talks to itself! There it is! IT’S THE INTERROBANG! I’m going to go for a lie down now but not before I say interrobang! Interrobang! It’s your red bucket isn’t it!? I’ve been spreading the word about the interrobang for about 5 years now. I even have an idea for T-shirts (they’ll say “What the…? !” on back and on front will say “Ask me about the interrobang!”) and a big one drawn right on my wall so I can point to it when it comes up in casual conversation. Which I can assure you it always, ALWAYS does. Interrobang?! Interrobang!! P.S. did you know the pound sign (#) is also called an octothorpe?